B.4.1. 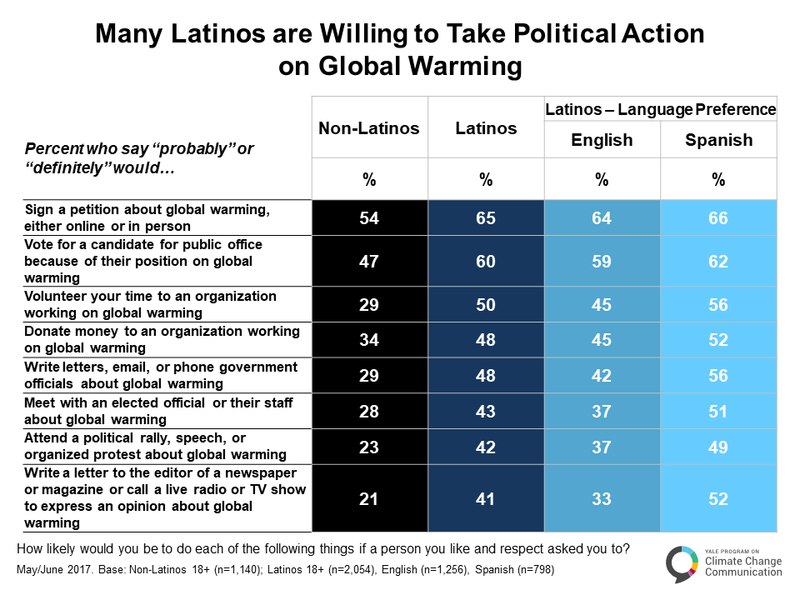 Many Latinos are willing to take political action on global warming. Most Latinos say they “definitely” or “probably” would sign a petition about global warming either online or in person (65%) or vote for a candidate for public office because of their position on global warming (60%). About half of Latinos would volunteer their time to an organization working on global warming (50%), donate money to an organization working on global warming (48%), or write letters, email, or phone government officials about global warming (48%). Non-Latinos are less likely to say they are willing to take political action on global warming. B.4.2. 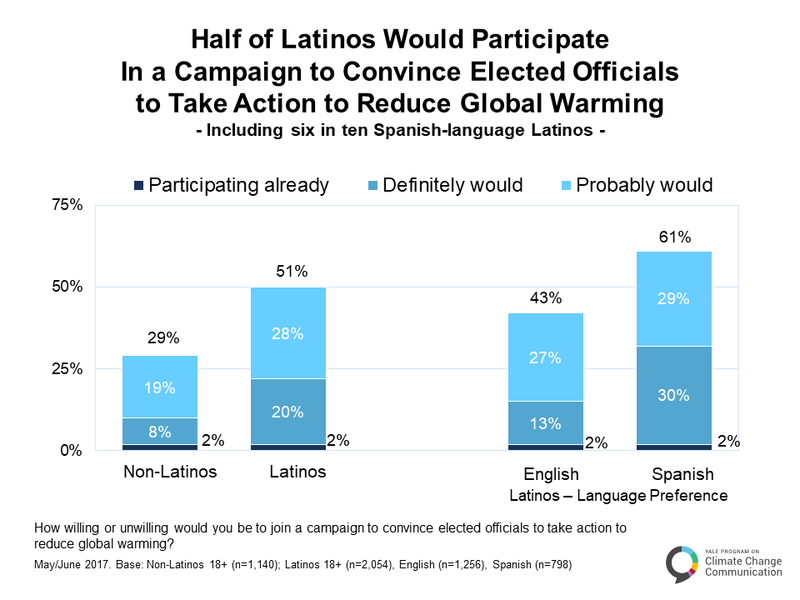 Half of Latinos would participate in a campaign to convince elected officials to take action to reduce global warming. Half of Latinos (51%) say they “definitely” or “probably” would participate, or already are participating, in a campaign to convince elected officials to take action to reduce global warming. Six in ten Spanish-language Latinos (61%) say they would participate or already are participating. By contrast, just three in ten non-Latinos (29%) say they would participate or are already participating in such a campaign. B.4.3. Seven in ten Latinos have never been contacted by an organization working to reduce global warming. 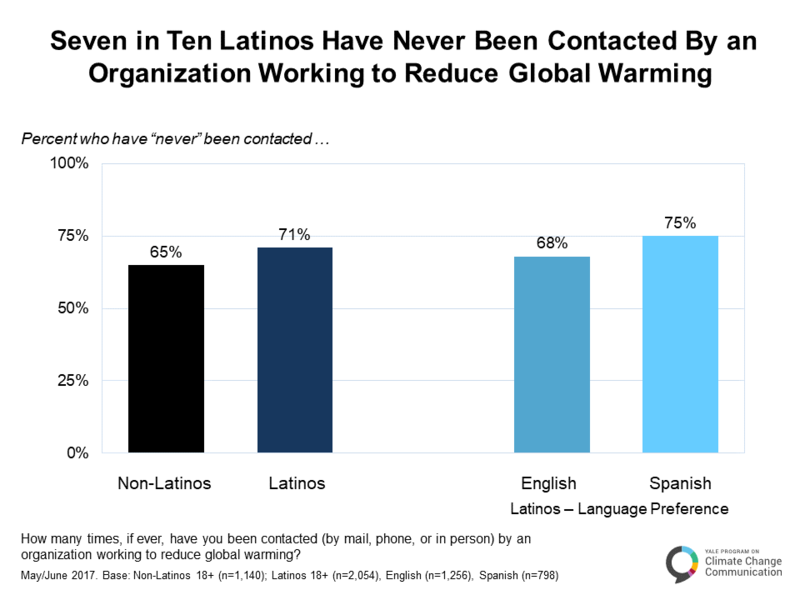 Seven in ten Latinos (71%) say they have “never” been contacted (by mail, phone, or in person) by an organization working to reduce global warming. Three in four Spanish-language Latinos (75%) have never been contacted. B.4.4. Latinos face different barriers to contacting elected officials about global warming. Latinos face different barriers than non-Latinos to contacting their elected officials about global warming. About three in four Latinos (73%) say nobody has ever asked them, and more than six in ten (64%) say they do not know which elected officials to contact. A majority of Latinos also say they are not activists (55%), they wouldn’t know what to say (54%), it would be too much effort (54%), it wouldn’t make any difference (53%), or they wouldn’t feel comfortable contacting elected officials about global warming (52%). 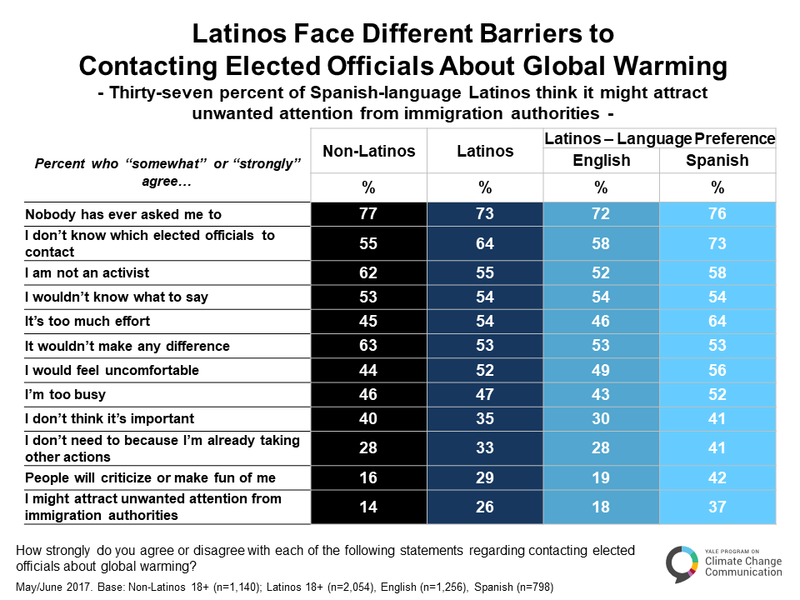 More than one in three Spanish-language Latinos (37%) say they might attract unwanted attention from immigration authorities if they contacted elected officials about global warming. B.4.5. One in four Latinos think people can affect what the government does about global warming. 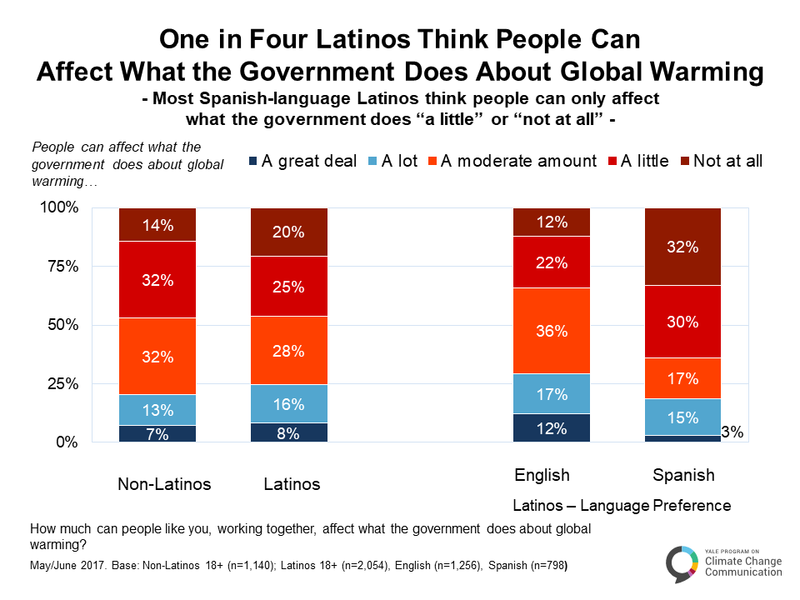 About one in four Latinos (24%) think people can affect what the government does about global warming either “a great deal” (8%) or “a lot” (16%). A majority of Spanish-language Latinos think people can only affect what the government does “a little” (30%) or “not at all” (32%).